The DOC - No One Can Do It Better. Vinyl LP. Bleep. 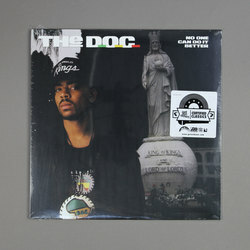 Nowadays not as many people know about The D.O.C. as they should. An affiliate of N.W.A., the LA MC was on his route to stardom before a serious car accident stalled his rise toward the end of 1989. The record he made five months prior to that crash, No One Can Do It Better, is important for many reasons. It’s the first LP that saw Dr. Dre step out on his own as a beatmaker; closer ‘The Grand Finale’ is the final time Ice Cube, M.C. Ren and Eazy-E would lay down bars together; and in terms of pure rapping ability The D.O.C. was arguably the best in California at that time. When he said No One Can Do It Better, he wasn’t playing. This new reissue presents the album on vinyl for the first time in a quarter of a century.